Will Stock Correction Lead to Bear Market? The first two weeks of the year have been the worst ever for US stock indexes. Indexes are now in correction territory for the second time in six months and the big swings are testing every investor’s internal fortitude and begging the question: will the correction lead to the first bear market in nearly seven years? Understandably, this period may cause a bit of déjà vu all over again, but the current situation is not like 2008 for many reasons. The first of which is that there is no financial crisis brewing and the second is that US economy, while not strong, is still growing by about 2-2.5 percent annually. Although some investors may be tempted to sell, they do so at their own peril. Market timing requires you to make two precise decisions, when to sell and then when to buy back in, something that is nearly impossible. The data show that when investors react, they generally make the wrong decision, which explains why the average investor has earned half of what they would have earned by buying and holding an S&P index fund. The best way to avoid falling into the trap of letting your emotions dictate your investment decisions is to remember that you’re a long-term investor, who doesn’t have all of your eggs in one basket. Try to adhere to a diversified portfolio strategy, based on your goals, risk tolerance and time horizon -- one that is not reactive to short-term market conditions, because over the long term, it works. It’s not easy to do, but sometimes the best action is NO ACTION. 1) Will Chinese growth accelerate? The cause of the early part of the New Year's sell-off was anxiety over a slowdown in China (sometimes referred to as a “hard landing”), which sent stocks there into a bear market, down 20 percent since the December high. This is not a new fear—investors have believed that a downshift in growth in the world’s second largest economy would inflict pain on the rest of the world, especially as China shifts from an economy that relies on government investment in building and infrastructure as well as manufacturing to one that is more consumer-based. 2) How many Fed Rate increases? The central bank pledged to raise rates gradually—according to its own projections, there are likely to be four quarter-point increases in 2016. But the bond market thinks that there will only be two, due to slower growth. If the Fed is correct, it would mean that US growth continues to accelerate and that inflation will rise towards the target 2 percent; if the bond market is correct, growth and inflation will likely stall in 2016. 3) Will crude oil steady/fall further/rise? Oil’s shaky start (down about 20 percent in the first two weeks of the year), comes after last year’s 30 percent drop and 2014’s 46 percent plunge. Crude is now down over 70 percent over the past 18 months. With Chinese demand cooling and supply remaining high -- the world is producing 1 million barrels of oil more than it’s consuming, which is pushing prices down. That’s good news for consumers, who will either save or spend the savings at the pumps, but bad news for energy companies, whose earnings are going to get shellacked. 4) Will US Economic Growth Accelerate? GDP growth last year is likely to come in around 2.25 percent, matching the results of the previous three years. Analysts are expecting growth of 2.5 percent in 2016, with some thinking that a recession is imminent. Part of the answer to this question may also be found in the movement of the US dollar, which in trade-weighted terms, is close to a ten-year high. With anxiety in China and emerging markets pushing capital to the US, the dollar could continue to rise, which would be bad news for US manufacturers and likely keep inflation too low in the eyes of the Federal Reserve. 5) Will Wages Finally Rise? The economy added 2.65 million jobs in 2015, the second best year for job creation in the past 15 years. (The best was 2014). While there was progress on job creation and the unemployment rate (5 percent), wage growth has lagged. With a tightening labor market, employers may have to dig deep and pay up to attract and retain qualified talent. That would be good news for workers, but not so hot for corporate America. 6) Will the Bear Emerge? The current bull market in US stocks turns seven years old in March, making it the third longest in history (1987-2000 is the winner, followed by 1949-1956). Just because the bull is aging, does not mean that it is doomed. However, it does mean that the pressure is mounting for companies to deliver earnings growth in a year when their compensation expenses are likely to rise, but they are unable to pass on those additional costs to customers. By the way, since the end of World War II (1945), there have been 12 full-blown bear markets (with losses of 20% +). Statistically they occur about 1 out of every 3.5 years, and last an average of 367 days. 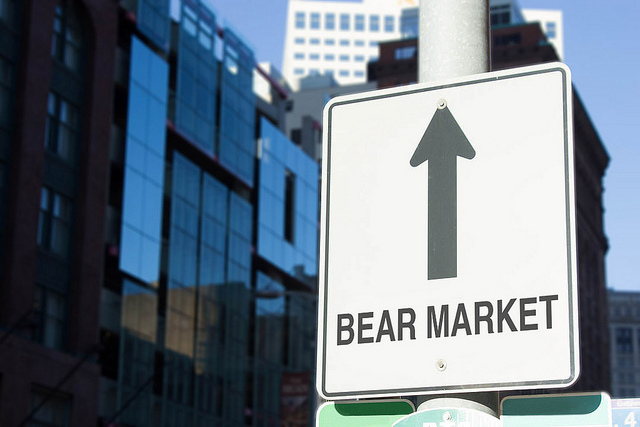 MARKETS: All three indices are in correction territory and the Russell 2000 index of small stocks, as well as certain other indexes like the Dow transports, is already in a bear market, defined as a 20 percent decline from the highs. For the Dow, which would be 14,681; for the S&P 500, it would be 1,708; and the NASDAQ would be in bear market territory if it hit 4,185.